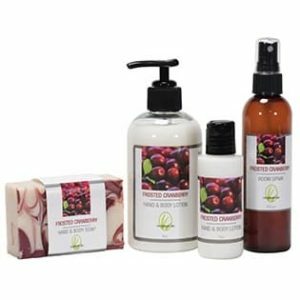 Layer yourself in our pomegranate seed extract infused products. Our deliciously scented grouping will please anyone on your shopping list. Includes Pomegranate Body Polish 8 oz., Spritz 4 oz., Lip Balm and Hand & Body Lotion Duo tucked inside a pink organza bag. Personalized gift card available for no additional charge. Lip Balm: beeswax, (theobroma cacao) cocoa butter, coconut oil, (prunus armeniaca) apricot kernal oil, castor oil, (tocopherol) vitamin E oil, phthalate-free fragrance oil, pomegranate seed extract, Stevia (natural sweetner), natural colorant.